Found object sculpture meets music with incoming Artist in Residence, Oregon composer, singer/songwriter, filmmaker, and artist Stephen Cohen, who is promising to design and create a “very, very big, playable string instrument using wood, metals and found objects” during his residency at Bush Barn Art center. The piece will then be available to view and play during the Salem Art Fair. During his residency Cohen will be bringing in materials, designing, and building the instrument, which he projects will be 6 to 10 feet high, 3 feet wide and a few feet deep. 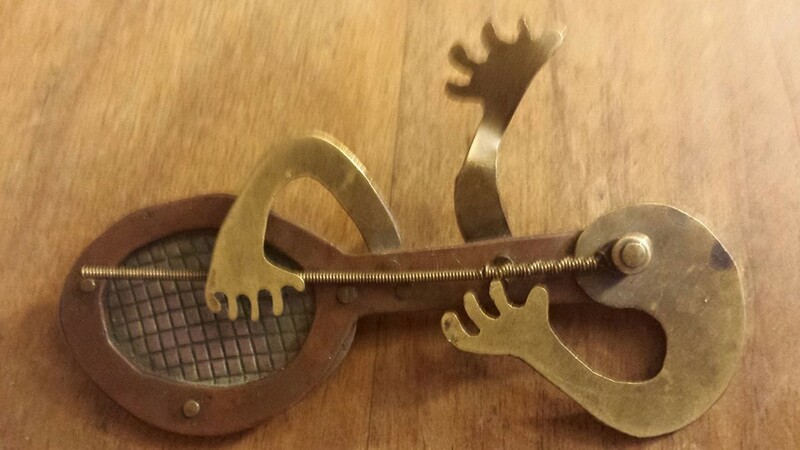 He has created a template which has the appearance of a humanoid/robotic figure. The strings on the instrument will be plucked and also played like a slide guitar, and the metal tube legs and other metal and wood parts could be hit with a mallet like a drum. There could be up to 15 strings with a full range of notes. 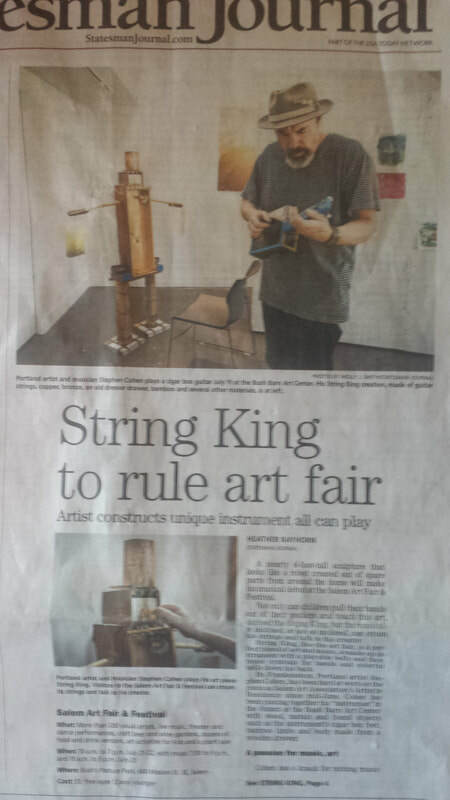 He also plans to adorn the piece with some of his guitar string bracelets and other jewelry. Cohen hopes visitors will have fun, be inspired to think, be creative and take a sense of wonder from the experience. He says, “I love interactive creativity because it has the element of spontaneous human communication.” The schedule of when he will be at the Annex will be available on his website, and anyone interested in participating is welcome to stop by, to observe, listen, share ideas, help with some of the artistic construction, and play the instrument when it is ready. I've shared concert stages with Portland based, 3-String Stephen Cohen on two occasions. Each time was a surreal experience. Cohen mixes psychedelic Dr. Seuss style poetry with drones and strange slide sounds. It's outsider music in the tradition of Jandek and Stone Breath. He has made his way across the US, performing at as many cigar box guitar festivals as possible. SE Portland’s Stephen Cohen has lived in a tree house in the mountains, in geodesic domes and makeshift shacks in several communes and is a performing, recording and visual artist using voice, cigar box guitars, acoustic guitar and a one of a kind miniature guitar in one of a kind performances. In 1979, Cohen and his friends recorded Tree People a highly-regarded and very collectible psychedelic folk album recorded during a weekend at The Rockin’ A Ranch in Greenleaf, Oregon. His new single is Miniature Planet, a musical contemplation like no other so very relevant in these fractured times of hairpin turns and rivers that turn many colors. A few years ago Johan Wellens from Tiliqua Records (at that time living in Tokyo, but he was an Antwerp friend of mine before he left) told me, knowing I loved the acid folk genre, I should check out Tree People. For him their albums were among his favorites of the genre and he was going to re-release their first album. Also the second album was going to be released on the label too but Guerssen took over the job, and now we have this, third album which fitted perfectly with the previous recordings. In fact it might even be the best of the three. And that is a strange thing because it is recorded some 31 years later as the first album without having lost any of its early charm. I did not even realize when I first heard the master that I was listening to a new recording at all! One of the elements which I liked very much from the beginning are the open, natural improvisations, leading to the more epic moments of songs, which reminded me like in the first album also of Ptarmigan, which I took as an example because such calm, breathy, natural landscapes of atmospheres working like breathing seashores around islands of songs are rarely dug out as inspirational sources in musical albums. These pieces are built from picking, double bass, glockenspiel and marvellous flute improvisations. The songs have touches of humour before they start like this child imitating an old women or the dog barking its share into the song, but also the songs themselves take life from the lightest side of seriousness. One of Stephen Cohen’s stronger later songs from his Stephen and the Talk Talk band reappears here as a perfect introduction as if saying musicians want to share the music. They have to share them like stories. Whatever people do with them does not matter. These stories take their own life. Stephen Cohen after Tree People (before the group was re-established again just recently) had gained experience in the narrative and epic field, after having worked with children and made also an album with songs for them (perhaps a part of that period relived in some songs like in “Living with the animals”). And this experience helped in picking out the right tracks to focus upon in this album. Also a new version of "Space Heater" from the first Tree People album reappears, but for the rest they are new songs. But more amazing are the improvisations, how after all these years Stephen succeeded to make this style advance so much after all these years. Perhaps not only this is the best Tree People album, I’m sure this will be a future classic too. [MINIMAL FOLK] Following up a great album is hard to do. Following it up after a 26-year recording hiatus is just dumb. And yet, the Tree People have picked up right where they left off. The Portland-via-Eugene psychedelic folk group’s reunion disc, It’s My Story, is an album that showcases the same off-kilter beauty of its predecessor, Human Voices, a disc released in 1984 and widely considered a lost folk gem until its reissue last year. The Tree People are a hard outfit to explain, because on paper the music sounds like your standard country fair fare: They’re called the Tree People, for chrissakes, and the instrumentation includes stand-up bass, panpipes, penny whistle and “throat singing.” But the band—multi-instrumentalists Stephen Cohen, Jeff Stier and Rich Hinrichsen—share a vision that’s more Sendak than Tolkien, and more Van Morrison than Donovan. There's a platitude that holds that everything happens at the right time, in the right place and for the right reason. It's taken 26 years for the Tree People to release a third album, but "It's My Story" feels like it's been delivered exactly on time. Devendra Banhart and his cohorts may have revitalized the genre, but freak/acid-folk has deep roots -- roots that wrap around the Tree People, who released their first album way back in 1979. While a lot has changed in the world at large, time has stood still in the best possible way in this kingdom. Finger-picked guitar, simple lyrics and whimsical flute/recorder lines create an alternate world of innocence and improvisation saturated by love and nature. Mainstays Stephen Cohen and Jeff Stier reunited in 2007, but there's a lot that could be attributed to 1967 here. Like a time machine devoted to transporting the listener back to a kinder, gentler, more wide-eyed age, this is a ticket to the Autumn of Love -- there's both beauty and sadness in the instrumental tracks, and Cohen's almost childlike vocals carry a weight (and a hope) that scores an emotional, complex bulls-eye. Cohen intones on "Legends of the Tree People." If you're allergic to patchouli, there's nothing to see here. If part of you secretly yearns for a positive pied piper to help you transcend the here and now, you should reacquaint yourself with the Tree People. I have to hold my hands up and admit that I'd never heard of this outfit before who hail from Oregon, U.S.A. After some investigations I found that they released their first album (self-titled) in 1979 and then followed that up with another ("Human Voices") five years later. I knew that teachers had long holidays, but this is ridiculous because this album is the band's third release- was it worth the wait? The current incarnation consists of Stephen Cohen (acoustic guitar), Jeff Stier (flute) and Rich Hinrichsen (double bass) with the added occasional voices of Maeve Stier and Nicole Campbell. Their music is basically folk but it's not as simple as that. There's to many tweaks in their work for them to be labelled with such a simple word. Which is why you will see the words "freak folk", "psych folk", and "alt-folk" tagged rather uncertainly to them. Whatever you call them, "It's My Story" is a wholly engaging album that, right from the start, pulls you into their head space. Beautifully melodic, the album is both busy and calming in its presentation. The title track, the first on Side One, grabs you immediately with a delicious selection of hooks while the next track on the side, "Sunday", takes you on an organic ambient journey of flute, double bass and acoustic guitar. And so it goes on, mixing instrumentals and vocal tracks throughout, in a wonderfully dreamy manner. For those wondering what the band was up to during its earlier days, you can get a flavor by checking out the track "Space Heater", which sits on Side Two and is a remake of the track which appeared on their debut release. A series of complicated ideas simply executed to form a magical album. About a month ago, I received an email that made me think ’90s punk-grunge outfit the Treepeople (featuring Built to Spill’s Doug Martsch) was reuniting. And, based solely on that band’s dirtied-up, angsty cover of the Smiths’ “Bigmouth Strikes Again”—not to mention my immense BTS fanhood—I was pretty excited. Little did I know I’d learn an underground history lesson in Northwest psych folk instead. See, Martsch’s Treepeople weren’t the first. Back in 1979, a man named Stephen Cohen went into “a studio in the woods near Eugene” (now-defunct Rockin’ A Ranch) and recorded a self-titled album under the Tree People name—an album one fan laid down 150 bucks for at Portland music store Exiled Records. “It didn’t last for very long,” Exiled owner Scott Simmons recalls. 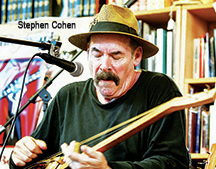 Cohen, who continued to play after the Tree People called it quits in 1985, says of the album’s 2006 Japanese reissue: “It is a nice feeling to do something, have it sit for years, and then be around to see it appreciated.” But to some, that original was already sonic gold: “People into psychedelic folk definitely know about it,” says Simmons. Here in Portland, plenty of music fans are into psychedelic folk, and—whether those fans know it or not—they could lump the Tree People’s spooky, hypnotic forest folk in with that of legendary faves like Texan duo Charalambides or British psych-folkstress Vashti Bunyan. All share a key aesthetic: a sound that’s one with nature, whether it be evoked by cryptic lyrics, sylvan flute, hand percussion or experimental forays into trancelike string noise. So why did the Tree People vanish? Cohen’s then-young children made touring a non-option, and original bandmate Jeff Stier (recorders, flute, hand drums) eventually moved to Washington, D.C., for work. When the kind-voiced Cohen started hearing from “collectors [and] music fans who all had somehow discovered our first vinyl album,” he contacted Stier only to find that he was moving back to Oregon. “The enthusiasm for our older recorded output [played] a big part in inspiring us to play again,” says Cohen. The reincarnated band—which is already working on fresh material with new double-bassist Rich Hinrichsen—played a “small, warm-up performance” this past Saturday at a coffee shop in Seattle. “It was great to get our feet wet again,” says Cohen. Simmons’ response when told the Tree People are playing Portland this week? “Oh, weird.” Yup, and pretty awesome, too. Human Voices, the Tree People’s second album from 1984, is a solid dose of American folk-rock. The group hailed from Eugene Oregon, releasing their debut LP in 1979. Human Voices was a limited edition cassette only release, of which only 300 copies were pressed. Stephen Cohen (guitar and voice), Jeff Stier (recorder, flue, bells and percussion) and Denis Mochary (drums) recorded the album at The Recording Arts Center. It’s an album that sounds wonderfully out of step with the post-punk times. Allmusic.com refers to the album as a “mini gem” while psychedelicfolk.com notes that Human Voices is “a very strong album, that should be regarded as a classic for the genre.” A few songs, such as the album opening title track, have an English folk influence (early 70s) but the rest of this LP is original American folk/folk-rock music. Highlights include “Grandfather,” a moody singer-songwriter number, “Thomas,” a great, ahead of its time indie sounding composition, the freeform “If That’s Entertainment” and a superb folk instrumental titled “Opus III,” which delves into spacy soundscapes. Human Voices is evenly divided between instrumentals and vocal arrangements. Guerssen Records, a reissue company based in Spain, reissued this very impressive title on vinyl and cd – it’s well worth a spin and highly recommend to those who are into freakier folk sounds. The Tree People "Human Voices"
Tiliqua Records is psyched about being able to present a whole new audience and generation with the lysergic beauty of the Tree People's sole recorded artifact, a privately released acid folk gem out of 1979. In times when people are all getting excited about media-created scenes like “New Weird America” and “Freak Folk”, they seem to overlook the fact that such music was already being created decades ago. The Tree People is evidence of such a splash of creativity that sadly enough was doomed to disappear within the cracks of obscurity. Until now. Tiliqua was granted the opportunity to restore this gem and with the kind collaboration of Mr. Cohen of the Tree People, who provided me with the master tapes and a seemingly unlimited support, Tiliqua was able to prepare this reissue. To me, this album is one of the singular most beautiful gems to have crossed my path and words always fall short in an attempt to describe the aural sensation it unleashes. “Upon listening today this hushed and intimate feeling still resonates through the music – the record possesses an extraordinarily potent atmosphere that still intoxicates the senses after so many years. Over a combustible backing dominated by shimmering strings, bone-shaking hand percussion rhythms, and quivering sensuous threads of eastern-toned flute playing, the group succeeded in concocting up a syncretic combination of meditative Indian raga, western folk stylings and idiosyncratic melodic ideas. The music breathes out intimacy and communicates with a rare directness - hooking you instantly with sheer aural bliss derived from the melody, from the flowing beat, from the sound of the words and syllables and of all those separate elements interacting with each other, rendered into a concentrated, gracious flow of lunar notes. The album's compositions have so many hidden qualities, all breathing out deep and affectionate sentiments that reveal, just like a lotus flower centered on the axis with its petals unfolding towards the circumference, a streamlined adhesion towards the group's' own singular creed. Listen to it and you may feel like awakening from a deep slumber, your unconsciousness leaking away as aspects of reality slowly mix in with the rest of your already blurred mindset.” First time ever official reissue, housed in a sturdy mini-LP styled gatefold sleeve. The forgotten legacy of the Tree People can be pretty accurately traced to one summer weekend in 1979 when Stephen Cohen, Jeff Stier, and Rachel Laderman, headed down to the secluded Rockin’ A Ranch Studio located somewhere in the backwaters of Oregon to record an album. Originally released as a limited run LP, the record slipped almost unnoticed into the dusty annals of history before Johan Wellens (owner and music archivist of Tokyo-based label Tiliqua records) salvaged the album from obscurity and re-released it on his own label. 28 years later, this long-neglected album flags up the telling historical debt that modern folk, in all its freaky derivations, owes to those early, unsung pioneers. While Cohen’s voice and acoustic guitar predominate, the contributions of Stier (percussion, recorder) and Laderman (flute) are just as essential. They react to his playing almost instinctively. It’s a good thing: the album’s nine songs often feel as though the group is merely jamming around pretty loose structures. (The quietly terrifying “Opus” might exemplify the group’s sensitivity to each other’s tonal fluctuations best.) Even the structured hippy rumba of “Morning Song” still sees Laderman frolicking with abandon on her flute over the syncopated rhythm. Perhaps as a result of their free-form approach, the tone of the album modulates between a dreamy acquiescence and a jagged purposefulness; the soothingly lyrical “Pot of Gold” and “The Pineapple Song,” the most structured pieces, contrast with the ad hoc violence of “Sliding”’s raw, steel-stringed riffs and raga-esque hand drum and the deliriously heathen cadenzas on “Space Heater” and “No More School.” These impromptu asides make listening to the album slightly unnerving, but hugely compelling—you never know when the next jarring slide or dissonant note is going to land. Like the reissue of Vashti Bunyan’s Just Another Diamond Day in 2000, this re-release goes some way toward preserving the easily overlooked tradition of outsider / psych folk from sliding into the realm of self-perpetuating myth. But to appreciate this album from a historical perspective, as the mere totem ancestor to folkies like Devendra, Espers, Six Organs of Admittance et al., would be to do it a gross disservice. Of even greater value, The Tree People is an album of exquisitely crafted music, regardless of its undoubted historical import. Here’s to their Lookaftering. The Tree Peo﻿ple were an Oregon based acoustic group centered around guitarist/vocalist/songwriter Stephen Cohen (who had recently been transplanted, hobo style coffee house to coffee house, from Rhode Island). “The Tree People” was privately released in 1979 and quickly disappeared into specialists collections. On the surface it would appear to be just another basic singer songwriter album, with an environmentalist message. Fortunately, it’s nothing of the sort. Rather “The Tree People” is a meditative, deeply introspective work, with a stunningly clear production, that really does make one feel they are amongst natural surroundings. The best tracks feature recorder and flute, such as ‘Opus’ (my personal favorite), ‘Pot of Gold’, ‘Morning Song’ and ‘The Pineapple Song’. Cohen has a slight rural twang in his voice, one that seems confident yet vulnerable. Despite the sparse nature of the recording, The Tree People are quite a distant cousin to the recent free-folk artists on exhibit today. For progressive folk fans, the comparisons go northwards towards some similarly minded Canadians. Perhaps most obvious would be the Vancouver based Ptarmigan, though there’s not a hint of aggression in The Tree People. But the acoustic guitar, fragile vocals and ample use of recorder are instantly recognizable. As well, there are similarities with their French speaking brethren in Quebec, such as L’Engouvelent or the earliest works by Connivence. I’ve seen comparisons as far-fetched as Comus, and I would say that’s about as far as one can get from The Tree People. Evil sounding aggressive pagan music? Not The Tree People! How about a new movement called Introspectica Americana? As is so often the case, due to family and career responsibilities, this was to be the end of the 4 piece band. They marched on as duo, even managing to get out a cassette in 1984 titled “Human Voices”. The CD reissue on Tiliqua Records is stunning. A beautiful Japanese mini-LP, extra thick cardboard, with a full history, photos, etc… It’s very obvious that this is a labor of love, and that the label owner is a huge fan of the album. Bravo. Not to be confused with Doug Martsch's amazing nineties outfit, the Treepeople, -these- Tree People are equally amazing, but are a whole different proposition. This disc was originally released as a super limited lp way back in 1979 and managed to quietly disappear. Now, here we are nearly three decades later, and whattaya know? There's a whole movement of modern free folk, 'freak' folk and the like, and if you didn't know better, pretty sure we could pass this off as some strange super limited cd-r by some modern folk revivalists. But keen ears would certainly be able to tell. This is so entirely original (especially for the time) and genuine sounding. Mostly acoustic guitars, flute and vocals, the Tree People had two distinct sounds, the first, a lilting melancholy moonlit folk, like Cat Stevens or Van Morrison, a gorgeous lazy drawl, rich and lustrous, over simple folk and fluttering flutes, dreamy and gorgeous, sounding like some lost folk classic one minute, a strange "Girl From Ipanema" style shuffle the next. But even at it's sweetest and softest, the record seems to always have a hint of melancholy, sometimes even a trace of ominous foreboding. Which definitely gives the songs a subtly dark undercurrent. The majority of the record however is spent in full on hippy jam mode. Very Comus-like at times (especially on track two, "Sliding"), wild steel string excursions, dense tangles of fingerpicked melodies and aggressive strummed riffs, with a definite raga like vibe, all over a smattering of hand drums and tablas, a glorious drifting buzzing steel string dronefolk, that just sounds so incredibly timeless. Elsewhere, the same jams evolve into more tranquil acoustic dreaminess, with the flutes floating over sweet lilting melodies, but even then, the songs will be peppered with sudden bursts of buzzing slide guitar, or brief squalls of atonal fingerpicking. SO cool. And considering the current love of all things freaky and folky, it's sort of amazing that stuff like this was already being made 27 years ago! Obviously, fans of the current crop of modern folk troubadours will find this absolutely essential, Devandra, Vetiver, Espers, Newsom, whatever your particular poison, the Tree People will fit in frighteningly well. Hard to say whether it speaks to the prescience of the Tree People, or just to how much these modern bands have actually been 'borrowing'. Either way, this is absolutely essential. Tree for all. Whether you call it freak folk, real people psych or new weird American music, the gently trippy self-titled debut from Oregon’s Tree People – recorded in 79 though it sounds like 69 – has risen to the top of the heap of the genre’s collectible artifacts. And once you hear the eerie flute, wistful strumming and entrancing hand percussion on the magnificently packaged reissue from Tiliqua Records, you’ll quickly understand why this fragile masterwork is so revered by connoisseurs of backwoods hippie hijinks. Fans of Espers, MV & EE and Voice of the Seven Woods should investigate. Above are reviews of The Tree People after it was reissued internationally in the 21st century. "Eugene singer-guitarist Stephen Cohen has produced an excellent album. What's more he's done it on his own and with his own finances. The sacrificies were worth the pain. The Tree People, recorded in Greenleaf by Michael Ayling, is simply a beautiful album.There is much here to like; maybe too much. In an effort to display all of Cohen's talents, the album contains five vocals and four instrumentals. The result is disconcerting. Just when the listener settles into one of Cohen's fine guitar grooves, Cohen breaks the mood with a vocal. And visa versa. The next time out Cohen might do well to settle on one style or another. The question is, which one? Cohen's vocals are wispy affairs reminescent of Leonard Cohen's. His voice is full of gentleness and melancholy, his songs long on fragmented melodies. The appeal is immediate. His guitar playing is delightful. His uses a variety of techniques to effectively tell his stories. Although every cut is a winner, the most rewarding are the vocals "Stranger," "Pot of Gold," and "Morning Song" and the instrumentals "Sliding," "Opus," and "Space Heater." Accompanying him is an excellent trio consisting of Rachel Laderman, flute; Jeff Stier, recorder; and James Thornbury, bass. They greatly enchance Cohen's haunting moods." "In the age of new wave music, it's nice to be reminded that some musicians are still in touch with a quieter, more meditative sensibility. Because they're so soft spoken, one rarely hears about them. And a hunger for publicity and financial success may not churn their stomachs, but they are out there. One of the best is Eugene's Stephen Cohen, a guitarist and singer whose group (Cohen, Jeff Stier, and Rachel Laderman) recently released it's first album, called The Tree People, which is also the name of the trio. The album was recorded and produced last August at the Rockin' A Ranch in Greenleaf, Oregon almost as if it were a live performance. Very little was over-dubbed and several custs were played straight through on the first take. Furthermore, the music's intensity is enchanced because the group carefully timed its studio appearance, recording when the were total control of the material and when their energies were at their creative peak, Cohen says. All nine songs were composed by Cohen and arranged by Cohen and Stier. Because Cohen's music is so distinctive, it creates a problem for those unimaginative reviewers who explain new music only in terms of which major artist it sounds like. I know I've never heard anything like it. But from the child-like cover illustration through the final note, the album is so fresh and unjaded it's like a breath of clean air. Certainly, as Cohen himself says, his music has a foreign feel, particulaly on instrumental numbers such as "Sliding", in which percussionist Stier cooks along on his bongos and Cohen makes his guitar alternately whine like a sitar and pound like a piano while following an almost Mid-Eastern rhythm. Stier, a versatile musician, is equally at ease adding eerie, mystical effects with a cymbal and wimsical, airy touches with bells throughout the album. The strong, classical elements in Cohen's music are highlighted by Laderman's flute and Stier's recorder. There's also James Thornbury's tasteful bass and back-up vocal work. Thornbury took time out from his own band, "The Raccoons" to sit in with the Tree People and his appearance is an impressive departure from his usual hard-driving style. But above all, Cohen's guitar dominates. For some unexplicable reason, the few critics who reviewed the album nagged Cohen for mixing vocal and instrumental numbers. Acually, it's a much stronger record because of the blend. to get and I just play it... When I first started playing at 14, I could hear the way I should be playing guitar and it wasn't any way I heard anybody else playing. I could even hear notes that I would be playing and years later I was playing them. I still work that way a lot." The 1,000 albums he pressed are gradually selling- some at stores but mainly at the group's performances and straight out of Cohen's and the other Tree People's backpacks. Whatever happens, The Tree People proves that unadulterated acoustic music is alive and well. Although it may be a little hard to find, it's worth the search." ﻿Technically speaking, "Outsider Art" is art produced by the unschooled and or insane. Technically speaking, Stephen Cohen is neither. The apparently sane Portland-based performing artist, composer, visual artist and songwriter uses acoustic guitar, voice, original sculptural percussion instruments made from metals, woods, recycled and found materials to create records of quiet beauty. Cohen officially studied trombone and holds a Bachelor's Degree in Art from the University of Oregon. Still, the formal definition of Outsider Art is often stretched to include such as Stephen, and there is no doubt that his music shares many of the intriguing traits of the genre: a child-like aura, a hand-made quality, and unfiltered directness. "It's My Story" begins with a spoken voice introducing a, well, story, over a haunting acoustic guitar figure. Cohen's own voice comes in over the storyteller's, singing, "It's my story, it's my story, you can take it, please don't leave it." Mandolin, bouzouki, drums, and lap steel are added; different voices enter telling fragments of other stories with Stephen singing the refrain over them. The total effect is one of the most emotionally affecting recordings I have experienced in a long time. Cohen's singing voice recalls Randy Newman and John Martyn without sounding quite like either. His guitar playing channels the simpler elements of Ry Cooder and Cooder-influences Lightnin' Hopkins and Joseph Spence. Taken together in a tune like "It's My Story," it adds up to a definitive depiction of the desperate human need to communicate. It is art devoid of pretension. More sound sculptures than songs, the tunes on this CD share qualities with Cohen's actual sculptures of percussion instruments and guitars, to wit: warmth, whimsy, and an unexpected depth. A narrator talks about surviving a slide down a mountain in an avalanche and it evolves into--what else--a slide guitar piece. Other pieces revolve around talk, war, politics, love, and children. Stephen has done weekly music groups with severely disturbed children, and the combination of love, patience, and deep caring that must be required for such an undertaking infuses his music. We live in an age where everyone can make a CD, and nearly everyone does. Just when I despair about the landfill this produces, I discover a CD like Stephen & The Talk Talk Band. This work likely wouldn't have been produced in an era of record company gatekeepers. And in the pre-internet/website days, I probably wouldn't have found it even if it had appeared somewhere on vinyl. I have done my best to describe it but you need to experience it. You will either "get it" or you won't. If you do, you will be the richer for it. Every now and then an artist comes to Woven Wheat Whispers and their music is totally unique from everything else on the site. This is certainly the case with Stephen Cohen, a songwriter, guitarist, composer and visual artist based in Portland, Oregon. Stephen Cohen and the Talk Talk Band was released in 2004 and from the first play, you realize that there is something different happing here. Blues scales and precise folk finger picking combine in a way that seems to be both organic, but also having an almost physical architectural quality. The opening track, "Talk To Me" is one of many that uses repeated spoken word samples and repeated guitar phrases. While it has a strong folk quality, the work of both Robert Fripp and Steve Reich come to mind. "Sliding" is the first of many tracks to use narration as an integral part of the piece. Here the story is of a real or imagined experience escaping a landfall in a ravine on the slopes of Mount Hood. The following instrumental passage incorporates a multitude of layered string instruments (and "non instruments"), with some jazz snare drumming to create a dense but crystal clear tune that has a most hypnotic quality. "A Few Passing Moments" is an totally instrumental piece that somehow manages to bring to mind the accurate playing of Leo Kottke, whilst simultaneously incorporating unusual rhythmic percussive instruments and (later) a jazz bass line. If you are perhaps a little worried that the album sounds a little too "arty", please don't be. Take a listen to "Dusty Old Freight Train" which is essentially a straightforward acoustic blues. Don't expect a plodding 12 bar though, this is firey and intense and contains some sensational guitar playing and top notch drumming. A red-jacketed band of half-human, half-animal musicians comes marching down the street, accompanied by a couple of oversized birds ... what an awesome introduction to Stephen Cohen'sHere Comes the Band! With a smoky-voiced delivery, vocal phrasing a little like Rickie Lee Jones, and an intimate coffee house presentation, Portland resident Stephen Cohen whams, tickles, and strums the strings of his guitar, which acts as much a percussion instrument as a keeper of melody, intertwined with the tinkles, knocks, and wobbles of his handmade musical gear. Rhythms are suspended and sometimes done away with entirely in several songs, tying together everything in a cohesive dream-like collection of thoughts put to music. Sound too heavy for a kids' album? Au contraire, my little ones, for that's the amazing thing about this CD: yer tiny kids can sing right along with every single song on the album, while grownups can bask in the glow of Cohen's musical inventiveness. Even though Cohen has been recording since 1979, Here Comes the Band is his first album specifically for kids. Soon-to-be Toddler Time classics include the mantra-like "Give Me That Toy! ", the boppity "Mr. Knickerbocker" and "Baseball, Baseball". The controlled chaos of "The Elephant Walk" mirrors, coincidentally, sounds produced by bands of the Elephant 6 collective (Olivia Tremor Control, Neutral Milk Hotel, etc. ), while the ethereal "Rain, Rain, Rain" fully utilizes Cohen's self-created percussion inventions. The three-part thread "Here Comes the Band / There Goes the Band / Sleepy Dreams (of the Band)" that runs through the CD gives Cohen a chance to name check his old group, the Talk Talk Band. By using a few tunes culled from some of his grownup albums, real life and fiction and Many Hats, Cohen shows his trust in kids' taste and intelligence. He's not making music for children, but just making music. Not only do you get Cohen's wonderful songs, the CD is also packaged with a lyrics booklet full of artwork by Christopher Shotola-Hardt, instructions on making your own instruments, and explanations of everyone's duties in the making of a CD ("The producer chooses the songs..."). Check out more of Cohen's work, it's pretty inspiring and amazing. Based in Portland, Oregon Stephen Cohen has been making art of one sort or another for nearly 30 years. Creating music, musical instruments, and visual art, Cohen integrates these three into his performing career. This is exactly the kind of person that should be making kids' music. To talk about the lyrics is to miss the album's chief allure, which is its music. As noted above, some of the musical transitions are seamless. Which isn't to say this is an entirely low-key album. "There Goes the Band" lists 13 people playing or singing on the track. "The Elephant Walk" sounds not a little bit like Fleetwood Mac's "Tusk." The lullabies at the end of the album are sweet as well. I can't review this album without noting the album packaging, which is one of the best I've seen this year. Lyrics, gorgeous illustrations by Christopher Shotola-Hardt, activities are in the liner notes, along with an explanation of what various people on the album (producer, engineer, visual artist) actually do. The album is most appropriate for kids ages 3 through 9, though it may create fans of parents who are 39. You can hear samples of 5 songs at the album's CD Baby page and hear "Baseball, Baseball" here. Stephen Cohen's album is a little bit like what might happen if Mr. David and Randy Newman decided to record a kids' album live on Prairie Home Companion. Here Comes the Bandestablishes a mood	and a world that will draw in you and your kids. It may not be the album your family listens to every day for a month, but it will be one you listen to occasionally for many years. Recommended. Stephen Cohen's music sounds simple, but to play "Rain, Rain, Rain" at a recent concert required the help of no fewer than five standing audience members, plus another two or three in the front row playing accompaniment on sets of tiny chimes. "Now I need those back at the end of the song," Cohen reminded the crowd at Performance Works NorthWest, an innovative community rehearsal and performance space in Southeast Portland. The folks standing held either rain machines -- nail-studded wood blocks that tinkled quietly when played with a stick -- or big sheets of copper and brass, and a smaller sheet of silver. Big Rain, Big Wind and Little Wind. "OK, go ahead and practice," he told the sheet metallistes, who already had begun to rumble and whang their instruments with unsettling alacrity. "Now, the guitars will start out and you guys keep still. Then the little chimes and the rain blocks come in, then the wind, but not too loud, otherwise you'll drown out everything." Somehow, it all worked -- the song progressed from the fingerpicked guitar melody and Cohen's vocal (little more than "I've been out in the rain" repeated) and weathered some exuberant rumbles from the wind department, only to subside gently, not with a bang but a tinkle. "Just toss 'em anywhere," he says, dismissing his impromptu accompanists after the song. "They're all metal and you can't break 'em -- I used to have some glass chimes, until they went the way of all glass." Cohen is a great one for all manner of musical impedimenta, which he hauls around in a big duffel custom-built by a guy who makes hot rod upholstery and body bags. 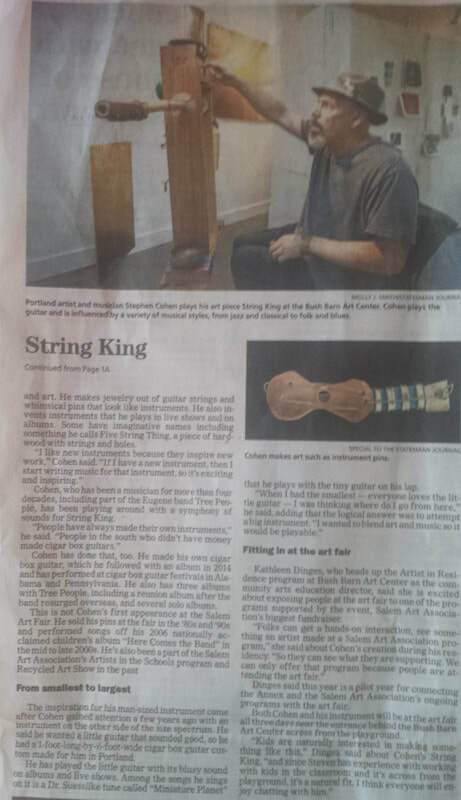 Cohen calls himself a "sculptural percussionist," which explains the profusion of stuff around his folding chair. By the time he sings a charming little ditty called "Baseball," he's won over the crowd for the night. "OK, in the chorus of this song, I'm gonna need you guys to make noise like you would at a baseball game -- just yell and shout." He moves a green canvas nearer his chair. It's a painting of "the Green Monster," the imposing wall at Boston's Fenway Park -- and a percussion instrument in this setting. "You've got a glove, you wear a hat," Cohen sings, "you hit the ball with the . . ."
Whack! He smacks the painting's frame with a drumstick as he moves into the singsong chorus, "Baseball, baseball, we like baseball. . . ." The crowd enters into its yelling assignment with a fine ferocity, and once again the song becomes more than the sum of its shouts. "I've been doing a lot of kids' concerts through the Arts Council," Cohen said after the show, "and they're very interactive shows. I'm incorporating that in my regular performances." Which would explain the seated guy who kept time by dribbling a basketball during the last of "Let's All Root for the Home Team," and Linda Austin's dance to an instrumental during which she used two bicycle kickstands as maracas. Or young Adam Frazell's imitation of a train whistle on the Hmong pipes during "The Dusty Old Freight Train," and Christopher Shotola-Hardt's bouzouki parts on several songs, including one sung in Hebrew and English. By the time he got to "The Closing List," Cohen's music was making complete sense. That dark little tune was minimalism at its best: The images of shutting down after that last night were sung in a world-weary drone that would've done Tom Waits proud. The sparse, compelling accompaniment was what the song needed to make it a jewel-like still life, as if Van Eyck had painted the death of a dream. And perhaps what I was feeling that night was gratitude for the human scale of Cohen's music and the sense of community engendered in the audience. In a culture that spawned Britney in all her marketing-driven, intra-modally synergistic glory, it's nice to know that guys still sit down with guitars and get people to sing along, and that there are still small, quirky spaces such as Performance Works NorthWest where art can happen unexpectedly. -John Foyston, The Oregonian, January 18, 2002.